It's time for a Purr-Facts post today and I found some really amazing ones, which I'd like to share with other cat lovers out there. I love finding out cool cat facts and I gotta say they do come in handy for me as a cat owner and lover. So I hope you'll enjoy my new Purr-Facts segment here at Meow Diaries, which I will turn into a regular posting slot from now on! 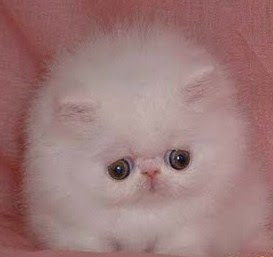 What do you think of this fluffy white kitty by the way? Oh my! Cats spend 30% of their waking hours grooming themselves. i love the 2nd fact!hahah! Recent blog:=- Chipmunks sang for me! Recent blog:=- What An Honor! Recent blog:=- Friday Fill-Ins: BBQ, Orange White Coffee! Awww. cats are real vain 30% of thier waking hours, that's so much time. hahahah! Oh she hasn’t gone pet shopping eh? I think she’s waiting for u GG! yeah! my mum used to do that, can see her oweiz! Love the fluffy cat, so pure white! Love this post with interesting and good tips about cats. You are good in choosing post(s) tau. How come not allowed Kitty there?? Woofies allowed or not? LOL yay! But only rec 200 not 250 oso… dunno dunno! diff kaler??? Phoebe is not white kah? rec 200 only? did u ask them why? Hahahaha aiyooo I don have white kitty la sweetie hahaha dat’s why I wan a white one now LOL! Phoebe is brown! :) Just like a fluffy brown bear hehehehe…. Haha so cute waking up at 8pm lol! Mmmmm dropping EC now only la… while day busy, then went out, then rushed out MM posts…now only got some time to drop! Phoebe is brown? hahahahha okok...still confused! white meow so cute lah! me too dropping ec now...yesd i managed to drop 300 LOL! After ur BBQ oso dropped 300, wow! I am finishing up for meows edi, then will drop for WOAFS! Ha ha ha I wan a white meow NOW if possible Mon… dunno when can get one…sigh…. I can imagine…today last day.. damn lazy to drop EC…. yeah as long as we don ve to follow back, it's good enuff edi LOL!! So damn cute la the doggie house but 500…so expense…. So fast right. Dec edi ho ho ho!! Mon not sleeping yet! Am still dropping here…slowly…. Wahhh ur done!! I am dropping last 50 for MPG… and I have currypuffs here! wahh so nice nya!! i don hv currypuffs here! My friends lagi teruk, siap suruh kucing dia baca doa makan sebelum makan. And he will recite the doa makan for them. LoL. Oh the orange and lemon is a must try! The kitten is so cute!! I thought it was Fluffball! alamak, now you make me want a fluffy kitten. Awww. So cute.. Reminds me of myself on first day of kindergarten. LOL! Recent blog:=- . ::I’m a Sherlock Holmes in the Making::.